This years Autumn Cup was hosted by Saltash Sailing Club, with a programme consisting of races in Plymouth Sound on Saturday followed by a Bottle Race up to Saltash Sailing Club and 2 races planned on Sunday on the river Tamar. 12 boats entered the Autumn cup, all being local boats, missing several of the travelling boats who are heading overseas in the coming week for the J/24 Europeans in Monaco. Whilst strong winds are not unseasonal the wind direction was uncommon with strong Easterlies whipping across the Sound followed by a ferocious squall topping out at 33knts giving troublesome conditions for the start line boat to anchor in. 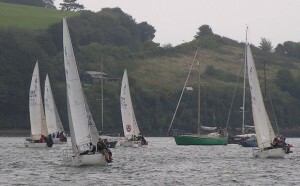 After 2 mainsails were ripped, faces stung by sharp rain, crews completely drenched (having established any Winter Series may need a new set of waterproof oilys) and a couple of J’s having taken the decision to head for home a judgement call was made to make an earlier retreat up river and continue racing in the Lynher. The committee boat set up a start-line in the more sheltered waters of Jenny Cliff with 9 boats heading up the River Tamar, North of Drakes Island & onwards towards the Tamar Bridge. Legal Alien was first to hoist their kite followed by shortly after by the rest of the fleet. 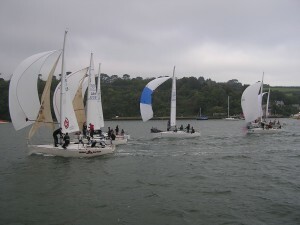 Gusty winds were soon surpassed by some challenging, frequently unpredictable conditions which kept all crews on their toes sailing along past the dockyards and up towards the Tamar Bridge. Redrow Homes, helmed by Tom Cload crossed the line first to win the Bottle Race. Following a brief stop-off outside Saltash Sailing Club, a Windward-Leeward course was set up in the Lynher with three races completed in quick succession. Jeli, helmed by Stig McDonald took the first race in the Lynher (race 2), with Nick McDonald helming Legal Alien winning race 3 and 4. The shelter of the river made the afternoons racing viable however not without some unruly gusts causing several boats to broach on the downwind league, including a spectacular bit of depth sounding along the Cornish boundaries by Team Redrow (thankfully softly into the estuaries muddy banks) Weary crews headed in after an exhilarating days sailing to a welcoming sailing club and warm dinner. 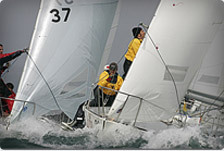 Sunday yielded another windy day with all to play for with the remaining 2 races. Legal Alien was in the lead with just 3 points clear of Jawbreaker and Jeli with 7 points each. Legal Alien proved un-touchable in Race 5 despite some hot competition from Redrow Homes and Illuminator, helmed by Mathew Conyers. Going into the final race there was still plenty of room for final positions to be changed. Race 6 was a tight race with the left side paying for the first 2 beats, but Legal Alien (helmed by Darren Stansbury in the final race) took a wild card heading to the far right on the final beat making up a fair 200m and rounding the windward mark looking like Cheshire cats and finishing the day with a clean sweep. Final results were; Legal Alien in First with 6 points, Jawbreaker in Second with 15 points, and Jeli with 18 points. 4th– Redrow homes, 5th– Jam Too, 6th – Illuminator, 7th –Skilled Services, 8th – Hijinks, 9th – Jo Jo (Winning Westerly), 10th – Just the Tonic, 11th– Nitro, 12th-Italian Job. 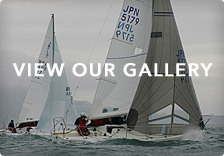 Good Luck to all the UK boats heading to Monaco for the J/24 Europeans 2013 this coming week.